Wonderful captures to tell a story. 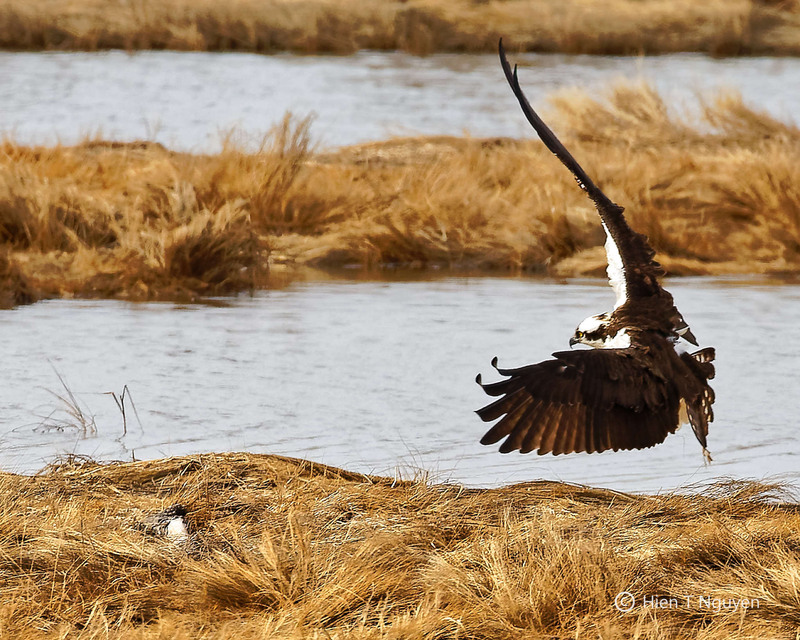 Beautiful photos and interesting sequence of these gorgeous birds, Hien. The image at takeoff is wonderful. Amazing that the crows take on the ospreys. Thank you Jane! Crows and Ravens are among the smartest birds around. 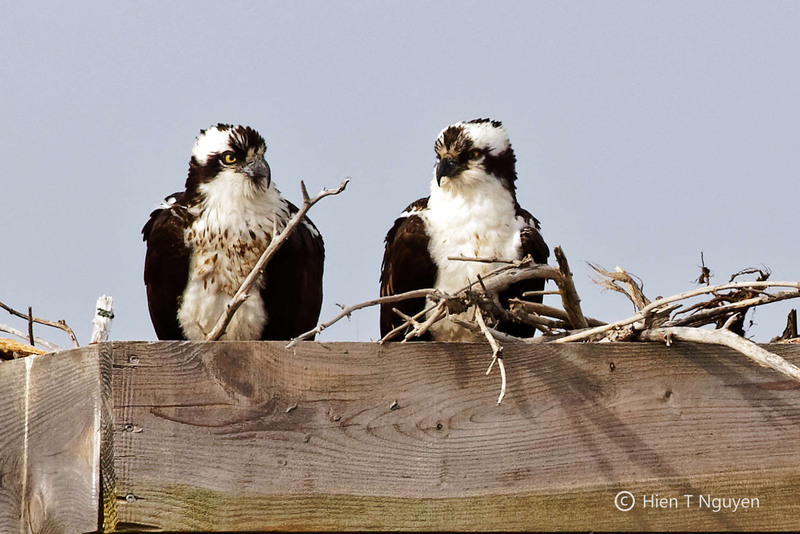 Love your ospreys, Hien! 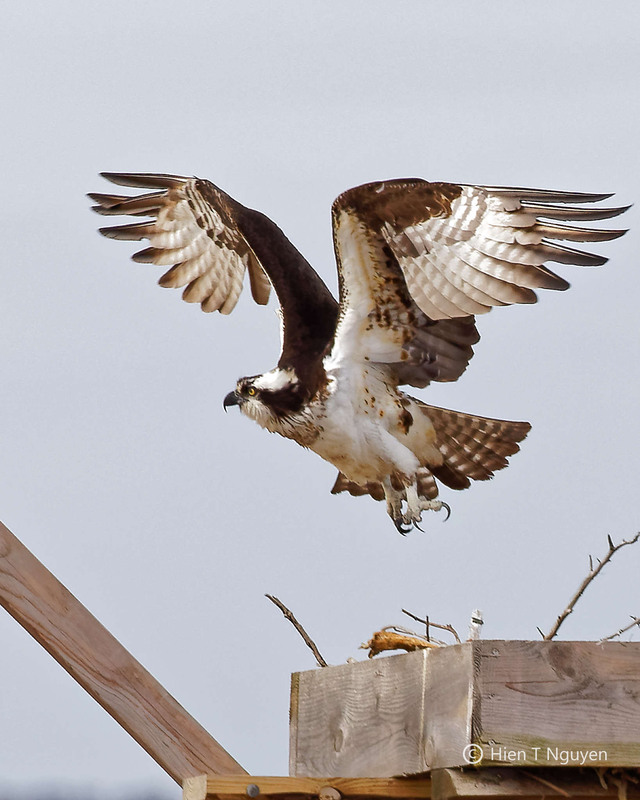 Crows do the same here and I’ve watched Papa Osprey’s flight show when he wants to get away from them 🙂 Happy your ospreys have returned and are building nests now. Thanks Tiny! 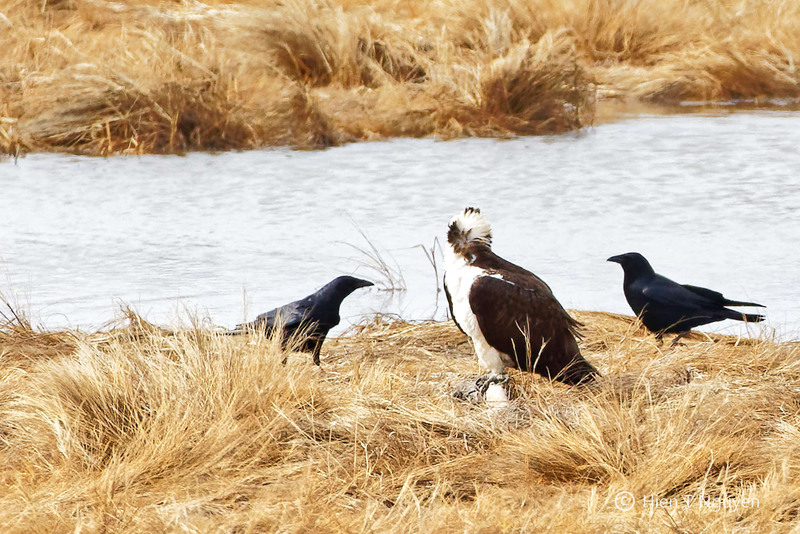 I am glad you have seen Crows behave similarly in your salt marsh. We seem to be developing a Crow problem in our area. For the past five years they have been eating all of your pears before they even a chance to ripen, and Trenton, NJ is trying to chase some 30,000 Crows that have become a nuisance for the city. Your photos of this little drama are great. 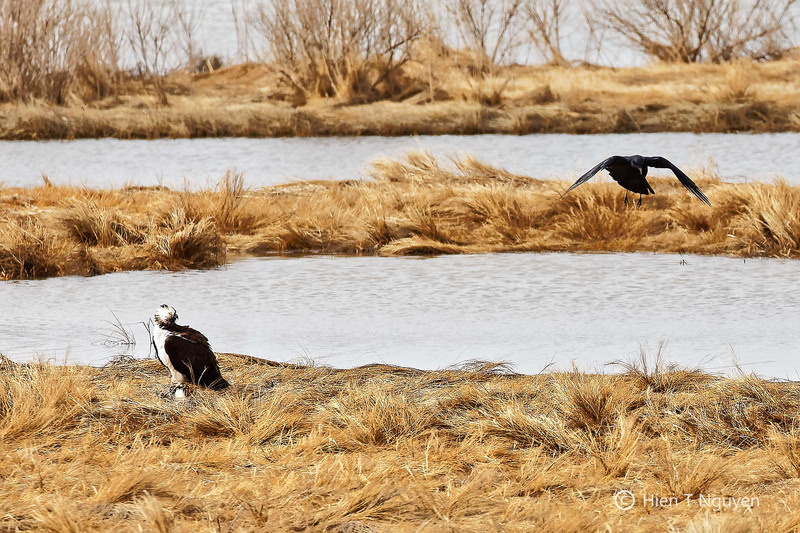 The other day I watched two Bald eagles, most likely also a pair, arguing over a bird one was eating – well the one eating wasn’t arguing, the other one was! And a cawing crow is what alerted me to the scene in the first place, maybe because the bird was a crow….there were dark feathers under the branch where the eagle was. Always something happening! 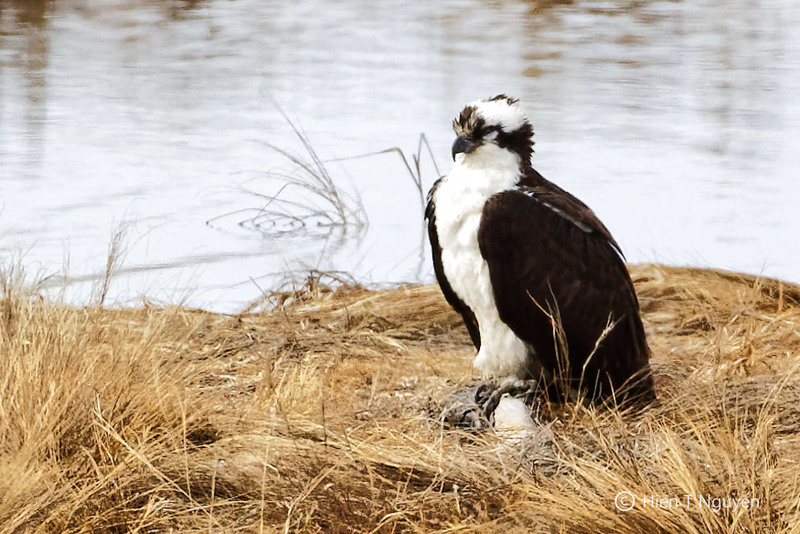 I’m glad your Ospreys are back, too. Thank you Doda! Glad you like these photos! 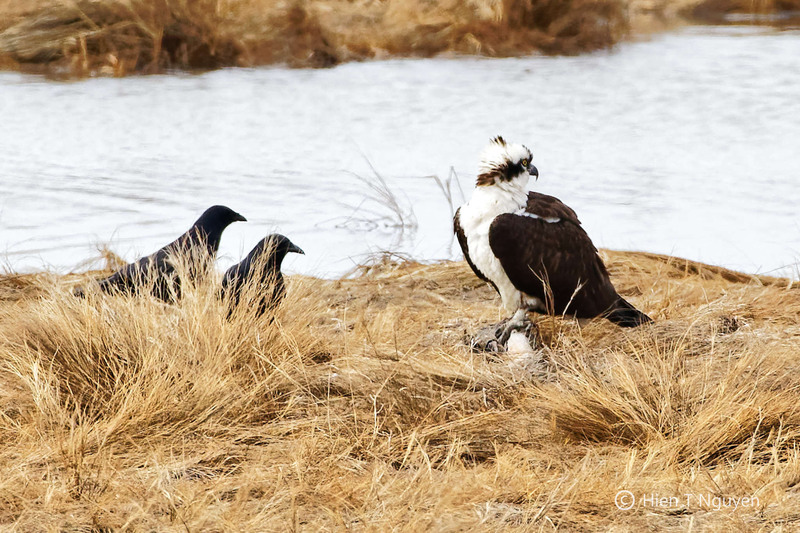 Great series, the third shot belongs on a cover of an Osprey magazine 🙂 Each photo holding something special, the interaction between the crows and osprey is something else. Well done. Thank you Randall! The Ospreys’ life centers around their nest, so I’ve learned to be there, be patient, and something sooner or later will happen. 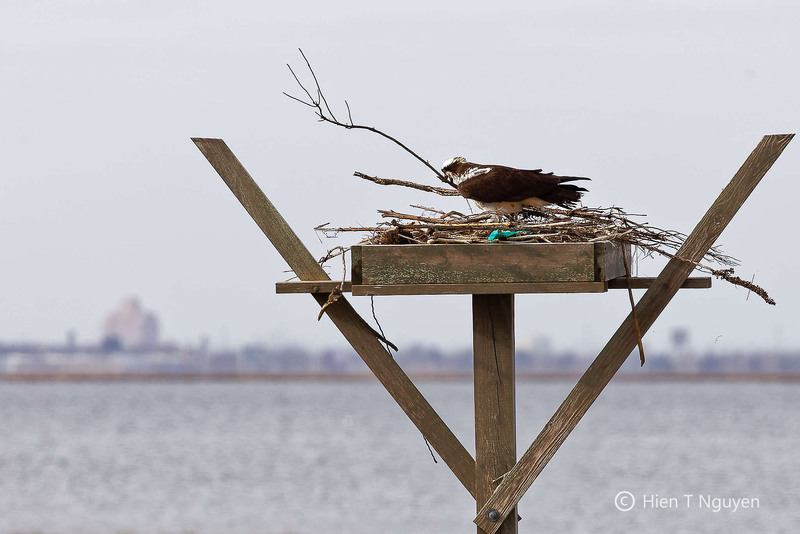 Two years ago, I learned that from a fellow photographer who told me he had been near an Osprey nest since 7 AM, and it was around 9:30 AM when I arrived. Hien, great story and pictures. Will the story continue? Maybe at 11 pm. Ha ha! I hope they were able to keep their fish! Wonderful post Hien. Congrats on capturing so much of the story with good images. Wow! What a superb series of images that not only show the beauty of the subjects, but also tell an entertaining story as well. I often attempt to figure out what birds are saying to each other in the ways that the “speak” but so far, I’m not having much luck. I wonder if birds can hear at frequencies above and/or below what we humans can hear, just as birds can see ultraviolet light when we can’t. 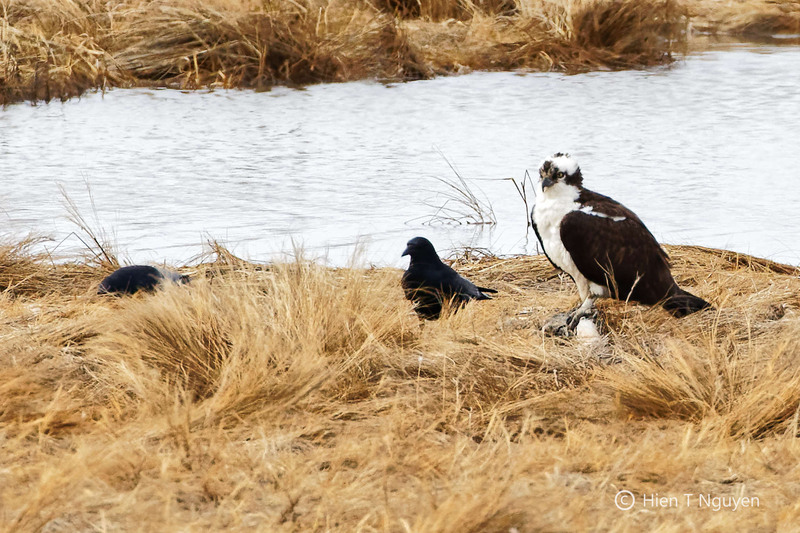 I would that thought that crow vs osprey would only go one way but there’s clearly strength in numbers. Thanks for commenting, Emma! I think the Crows can summon many of them to fight against one or two Ospreys. In a town near us, people are trying to chase 30,000 Crows away because of the noise and other forms of pollution they create. So far, no news of any human victory yet. Wow! 30,000 crows. sounds a bit nightmarish! 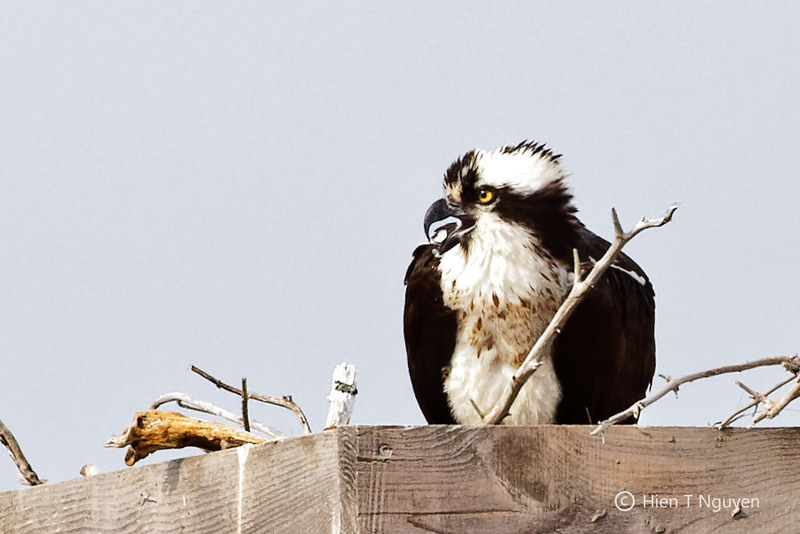 Nice to see Osprey up close like this. Thank you. Thank you Helen. I am glad you like these photos. It does seem that birds, or wildlife in general, share a lot of common traits with us. Maybe we all came from that primordial DNA, if there was such a thing. Interesting to ponder what is being communicated. He obviously has his own ideas of what to do! 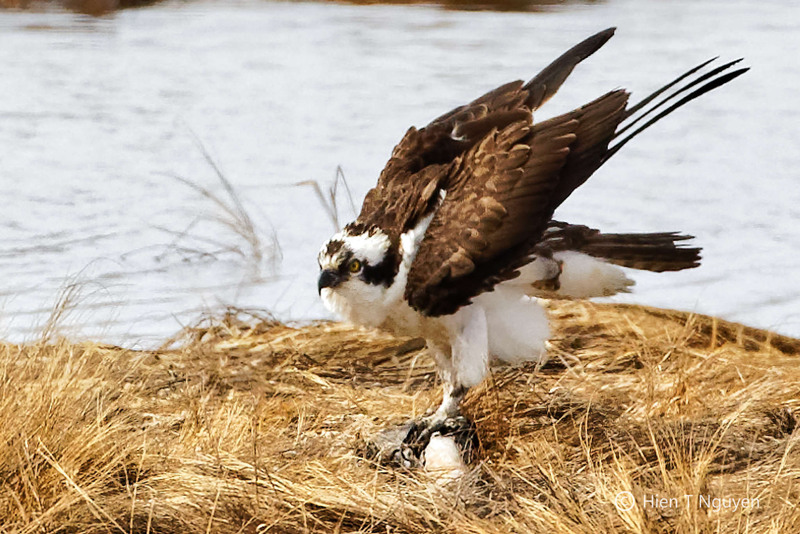 Great to watch this series, Hien, and the unfolding drama of the nesting ospreys. Your photos are fantastic. I love that one of the female lifting off (right before the crow photos) — seeing her hooked bill and powerful talons. 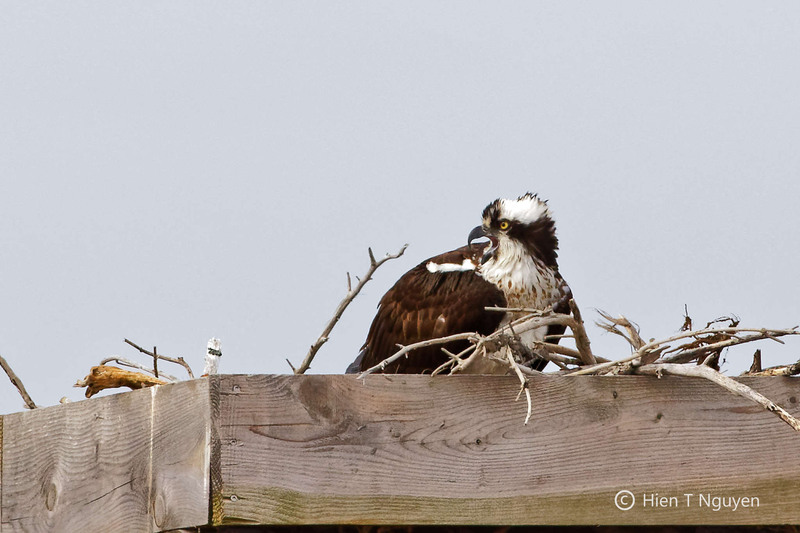 These Ospreys were a joy to watch, Jet! They don’t seem to mind people watching them and went about their life as if we weren’t there.